Gazing up into the canopies of the Costa Rican rainforest it can be difficult to distinguish what you are looking at. The forest can be so dark, varied and dense that it is hard to pick out critters even when they are right above you. Then out of the corner of your eye you might notice what you thought was part of a tree begin to move. As you see this mass move slowly up the tree you realize it is one of the two species of sloth that call Costa Rica home. There are two distinct species of sloth that are native to Costa Rica. They are the Brown Throated Three-Toed sloth and the other is the Hoffman’s Two Toed sloth. Both species are common assuming you know where to look. Sloths are mainly tree dwellers and are on the ground rarely. It is rather easy to distinguish between the two species because the black eye patches and “smiling” face belongs to the docile Three-Toed Sloth while the larger Two-Toed sloth has a white ringed face, shaggy coats and brown snouts. In addition, their hair is covered with algae which provides the sloth with natural camouflage in the trees where they spend roughly their entire lives while only rarely being on the jungle floor where they are at a huge disadvantage. 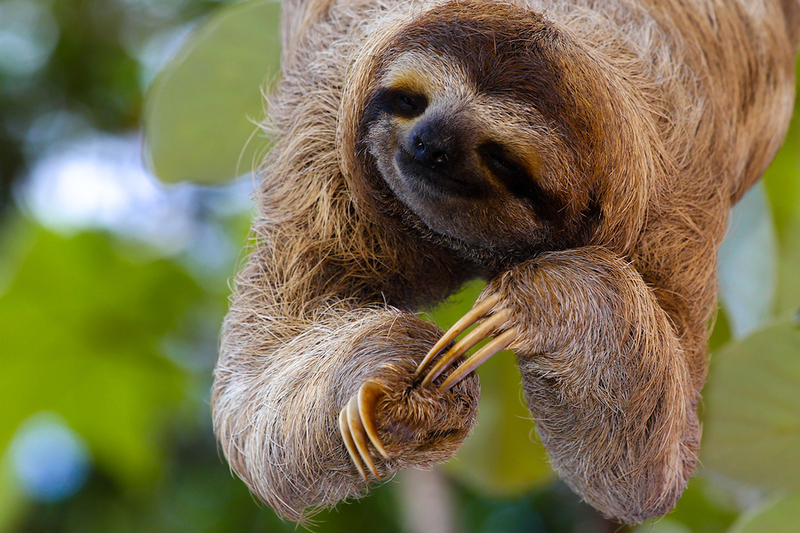 While not technically on the endangered species list, due to human encroachment on their territory the numbers of Costa Rican sloths have decreased over the years. With increased urbanization, farming and tourism it is important that the conservation of this species is of utmost importance. It is crucial that their habitat stays intact, urbanization curtailed and tourism soundly managed so as not to further destroy the environment for the animals otherwise they may not be around in the future if conservation goals are not met. The two varieties of Sloth in Costa Rica are in danger of being marginalized by either being injured or killed due to disease and habitat destruction due to the encroachment of their territory by people. Sloths are injured or killed because of the rapid expansion of their former territory being cultivated for human development. These are incredibly slow-moving creatures so with expanded urbanization and farming the Sloths territory is shrinking. Each road that is built cuts into its territory and when the sloths have to cross the roads to reach the areas that they live they are in danger due to their slow speed of being hit by vehicles. On my Costa Rica Photography Tour & Workshop we will photograph these incredible, yet mysterious creatures deep in the rainforests of Osa Peninsula. Both species of Sloth are both interesting and cute. They are very expressive and can be an interesting challenge to photograph while high up in the canopy. We often have to wait as they sloooowly move from branch to branch in order to get a clean shot! Want to photograph Sloths in Costa Rica this year as well as Monkeys, Dart Frogs, Toucans, Macaws and more? Join me on my annual Wildlife of Costa Rica Photography Tour & Workshop and explore the Osa Peninsula of this fabulously wild country.